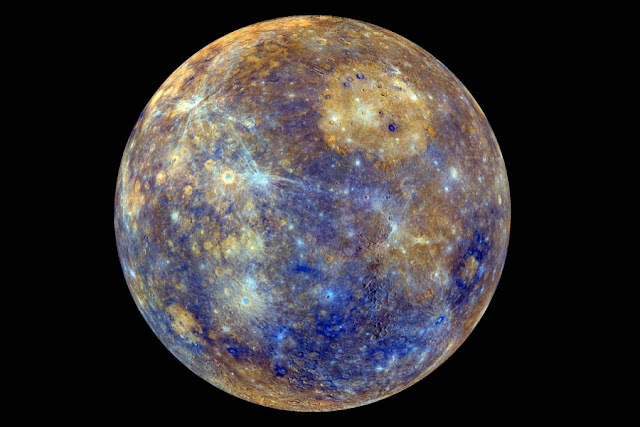 Above is one of the most accurate picture of the planet Mercury taken by NASA. 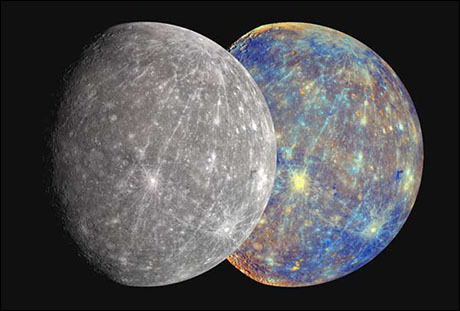 The Planet Mercury was always the gray planet closest to the sun. Our universe explorers NASA have a satellite in orbit called Messenger. Messenger is equipt with a multi filtered camera system that allows itself to isolate color variations and combine them for incredible photographs. It can actually perform mineralogical studies from orbit! In the pictures below you can see how Messenger's pictures differentiate rock types and colors. The yellowish color indicates a younger surface while the blueish color is a more aged surface. The younger surface is obvious due to its lack of impact scares caused by speeding space debris. Astronomers wish these color patterns could be viewed by the bare eye, unfortunately they can only be viewed this way through the Messenger's camera technologies.